Disclaimer: I bought these items with my own money. These are just cool products I wanted to share with you. The first is the tag*a*long. I have no idea now where I first ran across this item but I purchased two of them during a buy one get one free sale on Diapers.com right before Christmas. 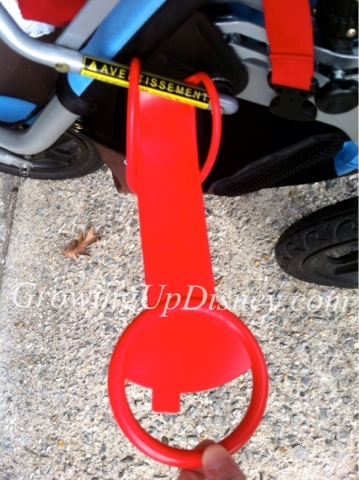 This is a handle that attaches to your stroller and gives your older child a place to walk beside the baby. I LOVE this thing. The website says you can attach it to a stroller, shopping cart, diaper bag, etc. We just have them on our single BOB stroller and a single Maclaren Volo. Tink loves "her handle." The first two pictures below were from our first walk with it and I made a game of holding the handle. 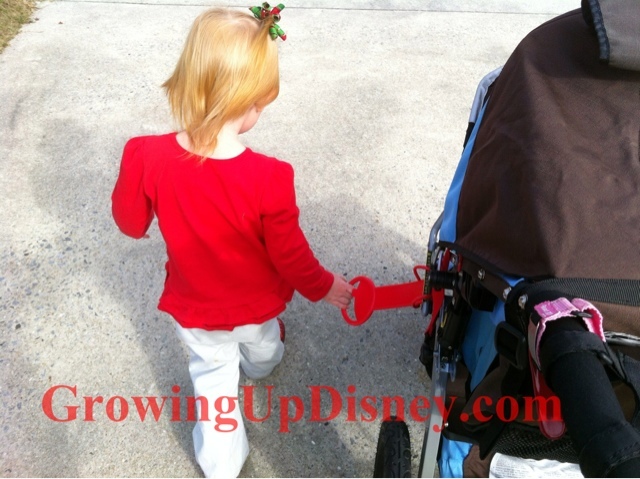 Now we use it going in and out of preschool and anywhere else we take the stroller. Tink is one to run off so having her stay close, especially around cars, is wonderful. The tag*a*long is very lightweight and seems quite tough. I don't baby it. The strollers get tossed in and out of the van and the tag*a*long looks just fine. Other moms comment on it all the time. I've seen other handles on Etsy that were essentially ribbon. Those are cute too but I like the durability of this one. And the fact that it is rigid helps keep Tink a step or two away from the wheels. The second item I have from buggyguard is the B-Hook. Now this one I have used and really like. 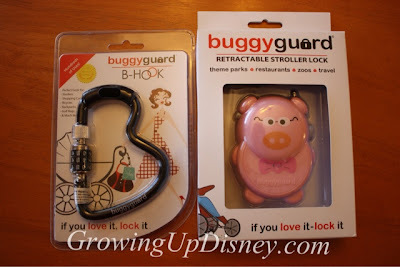 I have two plastic hooks on each of the jogging strollers but this stays in my diaper bag. I've used it to hang my diaper bag from a few grocery carts and, while the lock feature is optional, it's nice to know my stuff isn't going anywhere. I've had it hanging on the outside of my bag and Tink has used it as a handle a time or two. I can also see this coming in handy for locking things inside the basket of a stroller. Again, it could be defeated but it would take quite a while, so it would reduce crimes of opportunity. We've been doing this for years of Disney park visits with a simple bandana on the stroller. I really saw no real need to purchase the tagalong. With the bandana, big brother has something to hold on to and stay close. The super bright color my son picked out helps us pick out our stroller in the masses, especially when cast members move them. It's also super easy to toss it in the wash when we get home, so it's always clean for the next Disney day.